Ekal Cricket event 2012 was successfully organized at Zabeel Park, Dubai on 20th April, 2012. The overall feedback from the Ekal supporters and guests is that the event was well organized and it was a success. All enjoyed and there was the right blend of cricket, games, refreshments and Ekal. 1. The event started and ended with a melodious Sanskrit prayer by Shantiji. 2. It was a full day program of action and fun from 8.30 am to 9.00 pm, morning session was the coaching camp for children and afternoon was the cricket tournament. Cricket Coaching Camp (105 children) and Cricket Tournament (48 players) was very well conducted and coordinated by Mr. Gopal Jasapara. 3. Our target was 410 schools and we have got a commitment of 431 schools which includes surprise contributions on the day of the event for 36 schools and 20 schools against the prizes announced by Shri Harshad Bhai for the winners. 4. Good mix of audience of all age groups – children, youngsters and adults – it is estimated that around 400 plus people were part of the event. 5. Cricket celebrities – Mr. Hashan Tillakaratne, Former Cricketer of Sri Lanka, Mr. Sridharan Sriram and Mr. Sairaj Bahutule from India, added value to the event and attracted a lot of crowd especially the youngsters. All of them spoke and said that they would continue to support ‘Ekal’. Mr. S Sriram stated that he will visit the villages in Tamil Nadu. The children took autographs and were given certificates and there were many photo sessions with the celebrities and guests. 6. Mr. Hashan Tillakaratne stated that he is serious of implementing the ‘Ekal Model’ in Sri Lanka. Mrs. Tillakaratne also spoke very well about her good thoughts on ‘Cricket’ and ‘Ekal’. 7. Mr. Murthy of Bank of Baroda was the chief guest who inaugurated the souvenir which was distributed to all – one copy per family. He also spoke briefly and wished ‘Ekal’ the very best. 8. The quality and contents of the souvenir has been appreciated by one and all. 9. Mr. Pradeep Goyal and Mr. Jitu Bhai also spoke and expressed happiness at the conduct of the event and the progress being made. 10. The Tug of War, Games, Lucky draw with prizes was another good part of the event. 11. There were many new guests who were also keen to know about Ekal and were enthusiastic in the event. 12. It was heartening and encouraging to see around 16 youngsters who were studying in STD X to XII moving around actively in groups – distributing souvenirs, collecting business cards and distributing wrist bands. They were from the Friends of India Bal Bharti Team – introduced to Ekal by Shantiji. 13. Fourteen Food tables were set up by the volunteers and a variety of dishes were on display for the guests. The dishes were homemade brought by the volunteers which was very kind gesture of hospitality. It was very well organized, spread neatly and we did not run short of food till the end of the event. Ice cream, Tea and Laban were also available in abundance. 14. Announcement of ‘Ekal Young’ to be led by Ms. Deepika Mehta and Mr. Ashit Gandhi. 15. Next year’s Ekal Cricket Event to also have an ‘Ekal Women’s Team’. 16. One of the guests Mr. Lal Sawlani has committed to bring 500 people in the next program as his contribution for the ‘Ekal cause’. 17. Mr. S B Jain, President of JITTO announced that he will do his best to further the cause of Ekal and did commit 100- 200 schools from his group. 18. The programs started on time and ended around 9 pm, half an hour before schedule. 19. It was great opportunity for the volunteers, donors and supporters to interact and participate in the event. There was lot of cooperation and enthusiasm. The commentary was mainly on ‘Cricket and Ekal’- ‘On and off ‘what is Ekal and where it operates and how it works ‘ was announced for the benefit of the guests who were new to the concept of ‘Ekal’. 20. All Ekal volunteers contributed to the success of the event. 21. The speakers included Sri Harshad Bhai, Sri Bharat Bhai, Mrs. Geeta Chhabra, Apsari Hashan Thilakaratne, all the cricket celebrities and many others. 22. Sri Harshad Bhai announced a surprise that any donor who contributes more than 5 schools and wishes to go for Van Yatra, the to and fro air ticket cost will be borne by him personally. Of course there will be terms and conditions which will be informed. The event concluded with a vote of thanks, singing of the national anthem and a sublime melodious prayer by Shantiji. All those who were present felt elevated that all went off well and Ekal was the real winner. 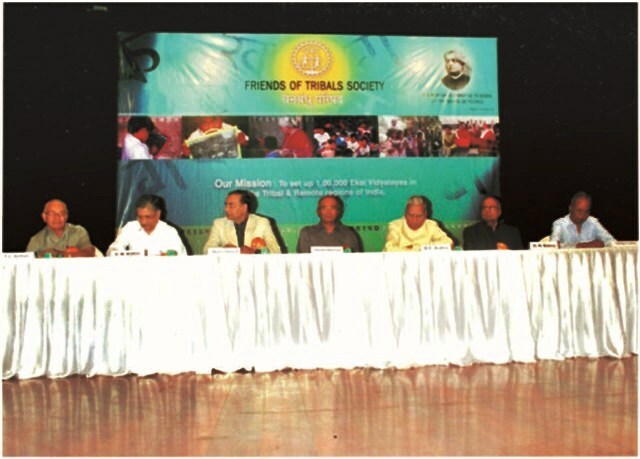 The Mumbai Chapter of Friends of Tribals Society celebrated its 14th Annual Day on March 2, 2012, at Nehru Auditorium. The programme started with the lighting of lamp, followed by screening of a short film on the activities of FTS. Sri Jitubhai Bhansali, President, Mumbai chapter welcomed the guests and Sri Rameshwarlal Kabra, National Patron, FTS delivered the keynote address. Sri Dilip Lakhi, an important patron of the chapter inspired invitees with his memorable experience and long association with FTS. Sri Motilal Oswal, Founder and Chairman, Motilal Oswal Group, was the Chief Guest and he deeply admired the noble cause, people involved, and work done by FTS. Inspired and impressed with the Ekal Movement, he donated one crore rupess for the cause, which surprised and enthralled many. The entire gathering clapped and gave him standing ovation. 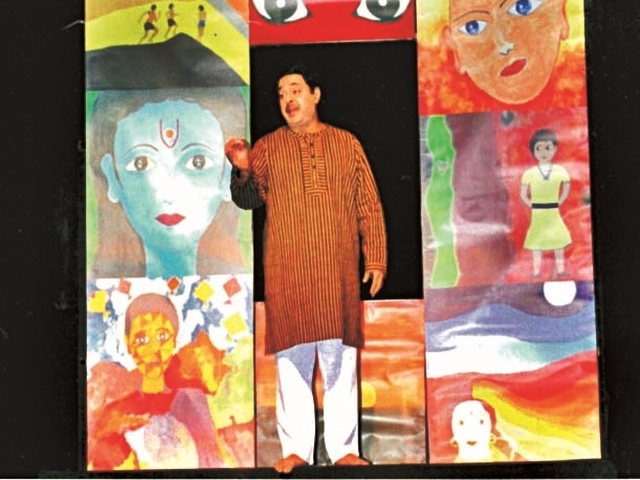 Saahab, a mono act play by the internationally famed artist Sri Shekhar Sen was staged to commemorate the occasion, which everyone immensely enjoyed and appreciated. Federal Bank supported Friends of Tribals Society - 'One Teacher School', for imparting education to the rural and tribal children in the area of Marayoor in Idukki district. 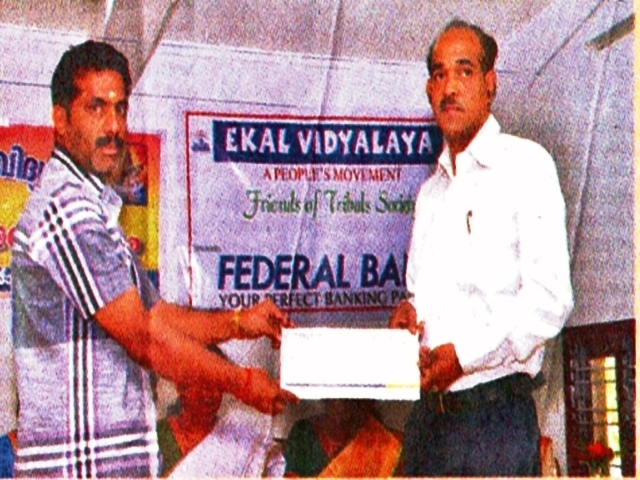 Ekal appreciates benevolent gesture of the Federal Bank. 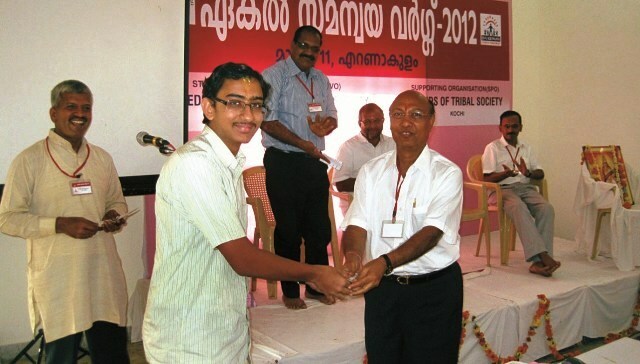 Master K. Venkatesh, a student of 11th standard of Bhavans Vidya Mandhir School, Cochin, has been donating his prize money to The Friends of Tribals Society, Cochin Chapter, for the last three years. This year, he donated Rs. 2,555/- towards the sponsorship of Ekal Education to FIVE children for one year and handed over the donation to Sri S.S. Agarwal, President, FTS, Cochin at the 'Samanvaya Varg' held there in the month of March. Kerala seen as 'God's own Country' but for Ekal it was a hard nut to crack. The field team faced lots of hurdles to initiate the Ekal Movement. Eventually Karyakartas, sincere efforts prevailed over every hurdle and till last year they opened 330 schools. This year they want 100% growth. They are also ready with the road map to reach 2000 villages by 2013 -14. The funding will also be generated from the state - Prant Swavalamban. 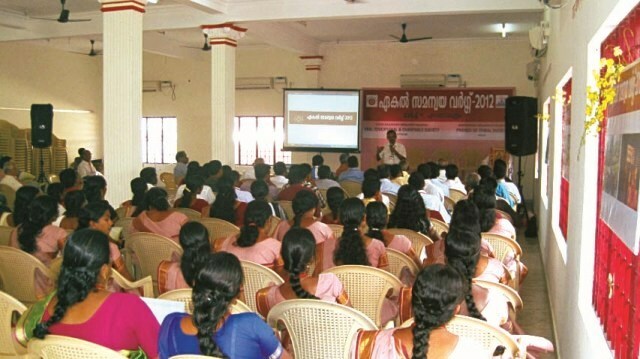 In the month of March, Kerala had a well attended Samanvaya Varg. Members of all the anchal and sankul samithi promised full cooperation for swavalamban and membership drive. And the credit of this success goes to the dedicated team led by Kum. Kalyani and Kum. Sujatha. Students of MOP College, Chennai together with the FTS, organized a fund raising cultural event Vaishnav Initiative for Social Help - VISH. 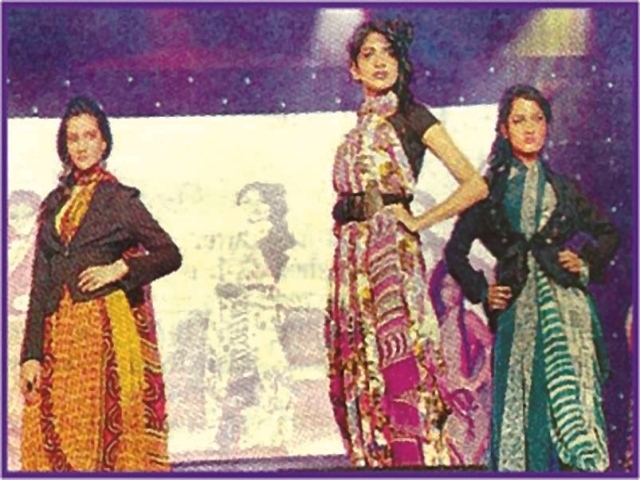 The programme feast included singing, dance and fashion show that featured artists like, Shweta Mohan, Charulatha, Krishna Iyer, Rajalakshmee and many more. The theme of this year's programme was education for the underprivileged. The show collected an impressive amount of Rs. 6 lacs to develop Ekal Schools in the rural interiors of Tamil Nadu. Around 1200 people came forward to support the cause, and girls played predominant role in the drive. College management also extended a significant support to write this noble success story. My family has a long-standing tradition of giving to those in need. I grew up learning to help the less fortunate. I donate to a food bank at least twice a year and made blankets to provide to charity, raise money to educate third world children, as well as assist local Bhutanese refugees. Not only have I helped on my own but I have participated in school service efforts. This all led up to helping with the Ekal fundraiser. I want to explain to you my views on service as well as my trip to India to visit the Ekal schools. Sometimes we do not understand the meaning of education when it is served on a golden platter. When you have to walk miles to get to school and when it is under a tree or in someone’s home is when you really understand how valuable it really is. School sometimes is seen as something you have to do but Ekal has made it fun for the children to go to school. They have made it something that the children want to do! Our charitable efforts have began with raising money in our family and then got bigger to both of our schools. This led us to go to India and visit some schools near Ghaziabad. The travel to the school was very different to us. We traveled through narrow roads and passed many freely walking cows. When we arrived at the first school the teacher and other people who lived in the village greeted so heart-warmly. We observed their daily school routines which began with a prayer. We learned that many of the children go to the government school in the morning and then go to the Ekal schools in the afternoon. When I went to the school most of the kids knew the English tables up to 5 and they knew a variety of poetry. The other school we visited was set-up in the teacher’s home. We observed children reciting poetry aloud to the class as well as doing their math tables. It was impressive to see how much the children had learned in just 2 months. It was a very heartwarming experience to not only see the fruit of what everyone who has contributed to Ekal but to see how joyous the children were to be learning something and experiencing what every child should have the right to. My participation in Ekal as well as other charitable efforts has taught me a lot about the world, as well as myself. I hope to share what I have learned with others, and create a ripple effect. We hope others will see our success and participate in helping the less fortunate. I believe we all can teach people lessons about giving. It may seem difficult to give someone your time or possessions but really in the end it will make your own life a whole lot better. There is a “dark side” to the world, but within that darkness lies much beauty and opportunity. It takes an understanding mind and a powerful will to wade through the darkness and release its hidden potential. I believe that service is the way to find yourself and to better understand the world. Mohandas Gandhi once said “The best way to find yourself is to lose yourself in the service of others.” By taking this to heart we can make a difference.